I decided at the beginning of the week to shake things up by restricting myself to simply reproducing the best quotes from around the world. One day in and it was already game, set and match to Dubai Police with two crackers neither of which require further comment (although I will slip a few in). Dubai Police Chief, Dahi Khalfan Tamim, urged Meir Dagan, the director of Israel’s Mossad, to “be a man” and admit that Israel stands behind last month’s assassination of Hamas chief Mahmoud al-Mabhouh. Good on you Mr Tamim and come on Mr Netanyahu, front up, we all know you did it. I don’t know if Mr Tamim is familiar with London buses but this is what a Dubai Police representative was quoted as saying in 7Days about the latest murder in Dubai. In my world everything happens in threes, and my advice to everyone is if there have been two plane crashes, wait for a third before setting forth, unless of course you are flying Qantas. Changing the subject completely, did you know that Janis Joplin, Jim Morrison and Jimi Hendrix all died aged 27? This came up in a recent quiz that my wife won by scoring 10 out of 10 in the literature round (misspent youth) and my reason for mentioning it is the BBC’s crazy proposal to axe 6 Music. It actually costs less to run 6 Music than the BBC pays Jonathan Ross to play silly pranks on the daughters of national institutions. While in this morbid mood it’s worth mentioning the sad demise of Michael Foot although he did have a very good innings. Throughout his political life he managed to pull off the trick of being a highly-respected, much-loved, left-wing politician. Best quote by Michael Foot “Men of power have no time to read; yet the men who do not read are unfit for power.” Also much loved was Mo Mowlam who was an absolute star in sorting out the mess in Northern Ireland and was played brilliantly by Julie Walters in a recent Channel 4 biopic. Sheer quality all round. The winner of the lyrics competition was Dani Connell, who promised me she didn’t use Google. Most controversy was caused by my 18lb trout story; honest guv it was a big ‘un. 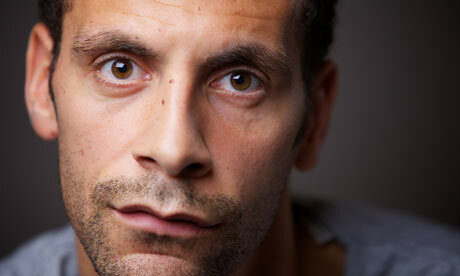 Picture of the week – Rio Ferdinand, England Football Captain. Makes you proud. Buy of the year – X-Mini, a brilliant mini speaker for your computer or iPod. Leave your comments in the box and press submit otherwise I’ll take your silence as tacit agreement with my view of life.